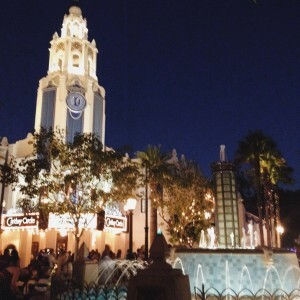 Set at the end of Buena Vista Street, the restaurant is an exact replica of the old Carthay Circle Theater where Snow White and the Seven Dwarfs premiered in 1937. With this in mind, much of the décor inside is inspired by Snow White or are direct photographs of the premier event itself. With an exterior that screams Art Deco and old Hollywood Glamour, the inside also doesn’t disappoint. While it feels very Old Hollywood, there is still a sense of modernity primarily because the building itself is actually very new. 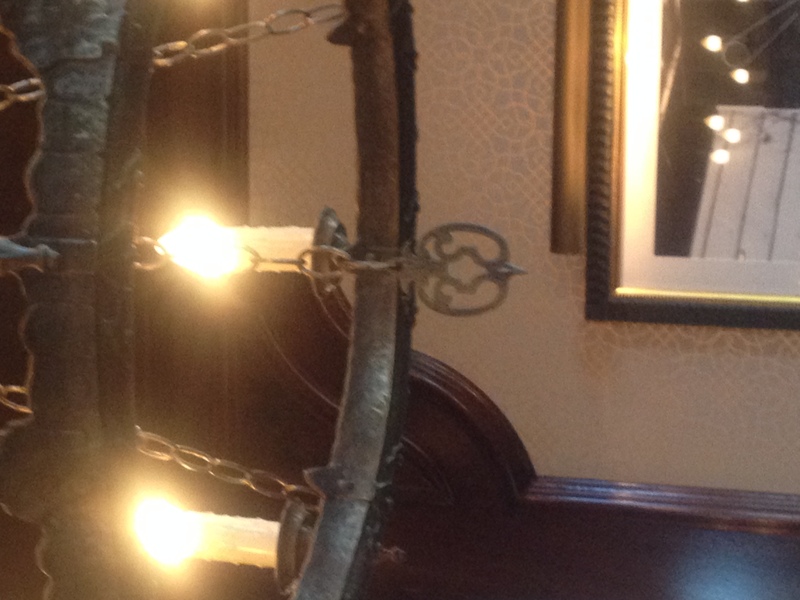 The ambience of the place is chic with exciting details that hint at the grand spectacle the old Carthay was so known for. In short, the atmosphere is elegant and impressive. You instantly feel transported to another time and place, and I certainly felt as though I should have been wearing an Oscar-worthy gown! Also be sure to stop by at night to see her all lit up and fancy! When you first walk in, you’ll be greeted by a cast member dressed as a theater usher. 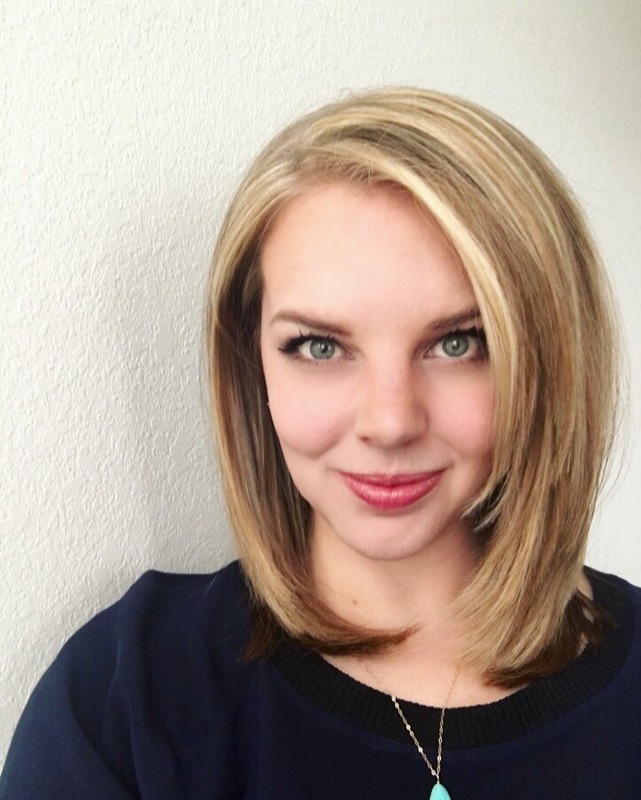 This person is actually here to take your reservation. Pretty standard. Upon entrance to the building, you’ll first walk into the very swanky Carthay Circle Lounge. The Lounge is where we ate first. With the expectation of small appetizers and specialty drinks, we were happily surprised when many of the apps offered were nearly full-meal portions. 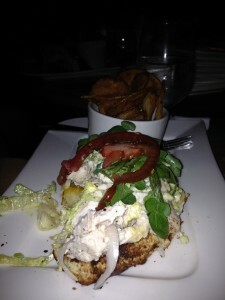 The citrus roasted chicken sandwich was the thing that was such a surprise. It was huge! The majority of those in our party ordered this, and were totally full by the end of the meal. Upon hearing Carthay was known for its martinis, I decided to order the Pear Martini. It was light, not too sweet, not too bitter, and was only slightly strong. Just how I like it. 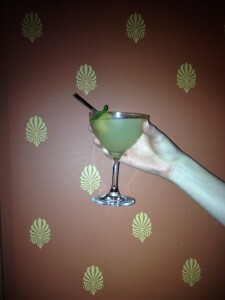 While this was the only cocktail I tried, it was wonderful (and felt fancy). I’d highly recommend it for those who enjoy a drink or two. 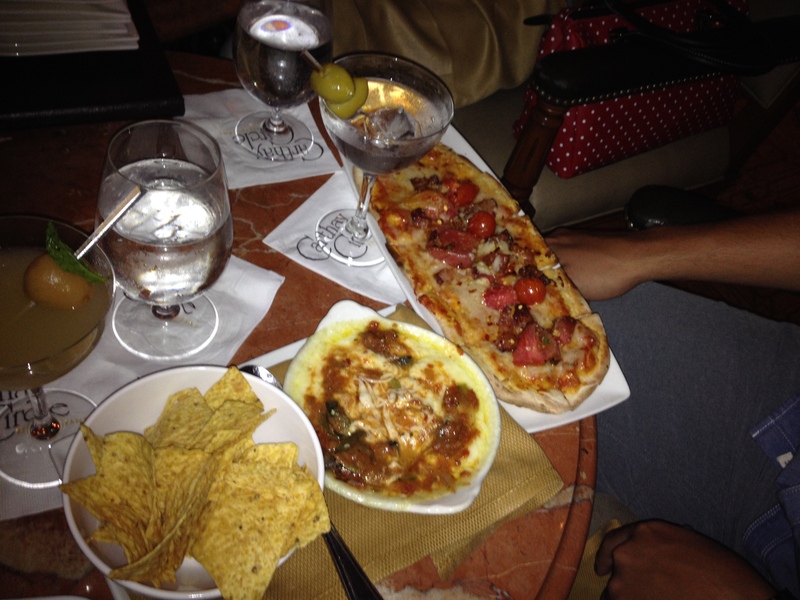 My favorite menu item at the lounge was the queso fundido. It was an interesting take on a classic dip, and with the something meat on top, gave a more full-bodied flavor and filled us up much more than a basic queso normally would. The Carthay flatbread was solid. With heirloom tomatoes, bacon, basil, and aged provolone, it was a good filler and was very tasty. 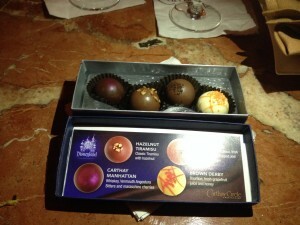 For desert in the lounge, Josh and I had the Diamond Celebration truffles. To me, the menu was unclear and I was expecting a single truffle to quench my sweet tooth. But I was happily surprised to see that I got four! 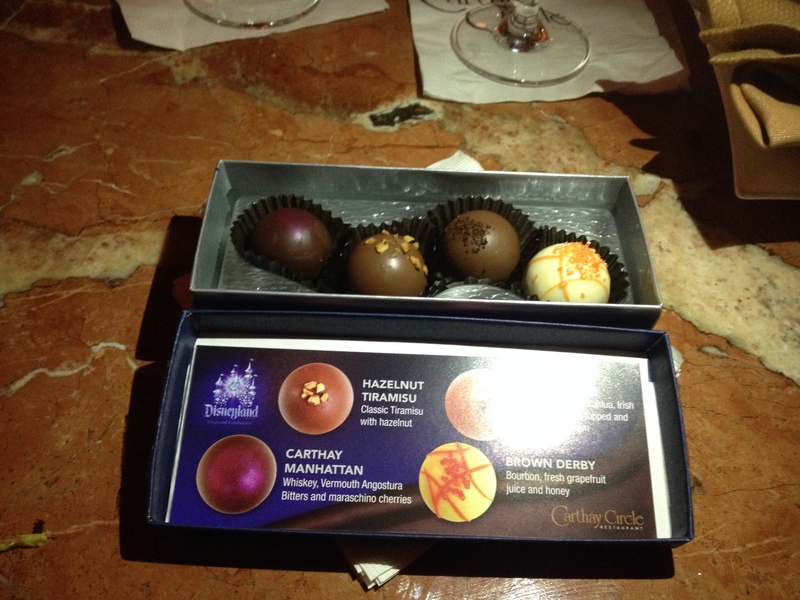 The assortment included flavors of the Carthay Manhattan, Brown Derby, B52 Coffee, and Hazelnut Tiramisu. 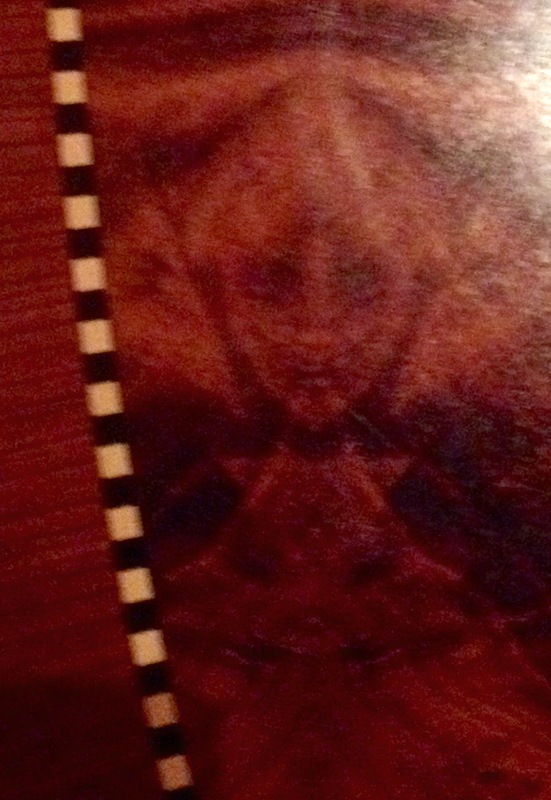 It was a really nice, light end to a great meal. The main dining room is actually upstairs in the building and is located in a large room that is a perfect circle. There are several smaller private dining rooms within the circle to provide intimacy and divide up the space. The center of the room is highlighted with a truly awesome skylight surrounded by a gorgeous mural taken from the scenery in Snow White. Our wonderful server, Megan, actually told us it is the scenery from the wishing well scene in the movie. 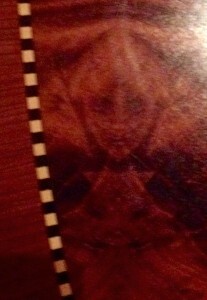 Megan also showed us tons of little details in the dining room including the Evil Queen in the wood grain. 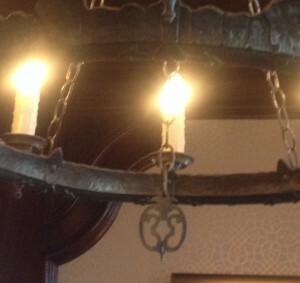 The medallion dangling from the chandeliers is actually a poison apple. 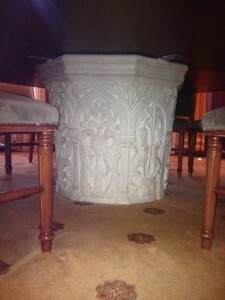 The base of the table in the “Snow White” dining room is a perfect model of the wishing well in the movie. 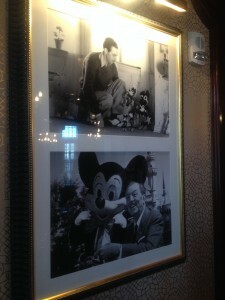 Also in the Snow White Room are two very important photos of Walt Disney. These are the first and last publish photographs of Walt with Mickey Mouse. I’m telling you, it’s stuff like this that sets Disney apart. Normally a red wine drinker, I took a left turn and decided to go with a white. Our server recommended the MacMurray Ranch Pinot Gris. It was very pleasant, crisp, fresh and just dry enough. Josh ordered an amazing pinapple cider that was so unique from anything either of us had ever tried before. Definitely something to taste if you’re in the neighborhood! 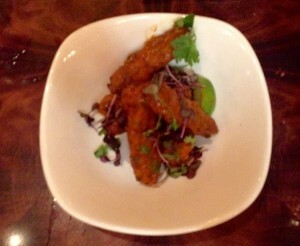 We started with the firecracker duck wings. I mean, bravo Carthay. This was literally the best thing we had there. There was a really nice lightness to its crisp, and the sauce definitely hinted of a traditional buffalo sauce, but had more of a zing. We decided it was slightly more spicy and had a vinegar tinge to it that gave it that unique taste. The meat itself was perfect. Perfectly cooked, rich and buttery, for me the duck wings were the star of the show. For my entree, I decided to go with the Tempura Fried Shrimp over a black rice and quinoa stir-fry. It was delicious! A really interesting fusion take on shrimp with a great portion size was great. The mixture of textures was nice and overall I really enjoyed the flavor. 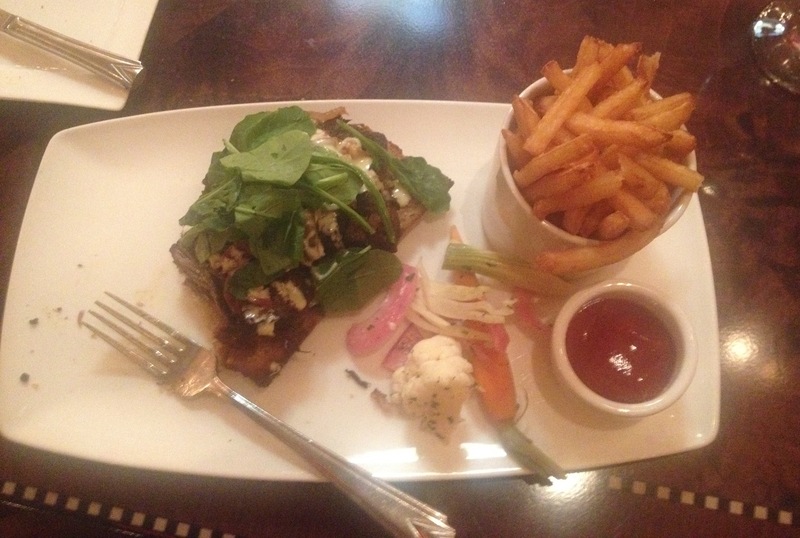 Josh had the ultimate braised short rib beef sandwich. It was pretty much what you would expect of a well-cooked short rib. The sauce was great, but nothing super unique. We opted for the dark chocolate mousse bar. 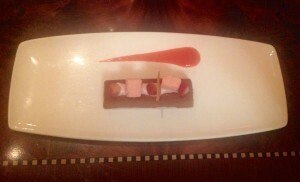 It was a bar of a dark chocolate mousse with a nice raspberry puree. 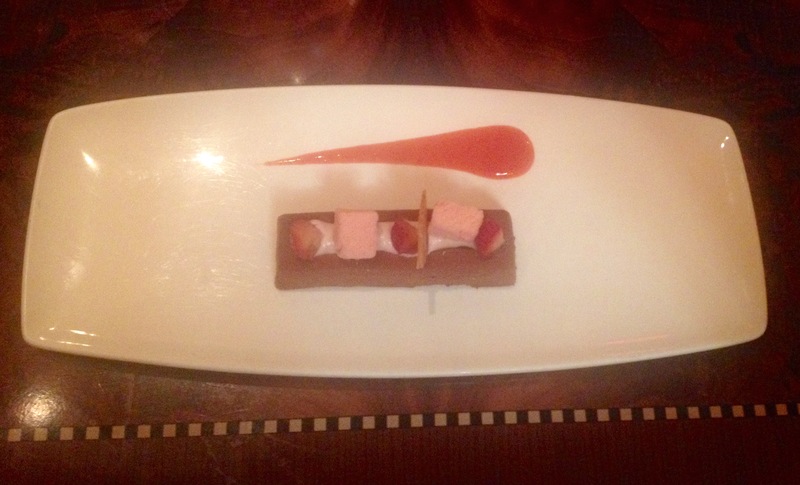 It included fresh raspberries and wafers to garnish. Nothing major, still very good, and I definitely appreciated the presentation. Overall we had an amazing experience. We went on a Sunday for a late lunch, so it wasn’t at all crowded. I think this added to the ambience, since we got extra attention in our little tour from Megan and we were able to sit in the main dining room. 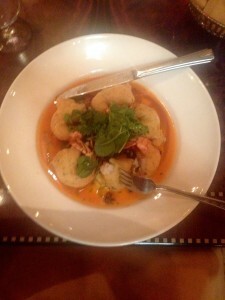 I definitely think for a meal, you want to go with the restaurant, though for a drink and quick bite, the lounge is not bad. The cocktails were great and you can’t beat that queso! 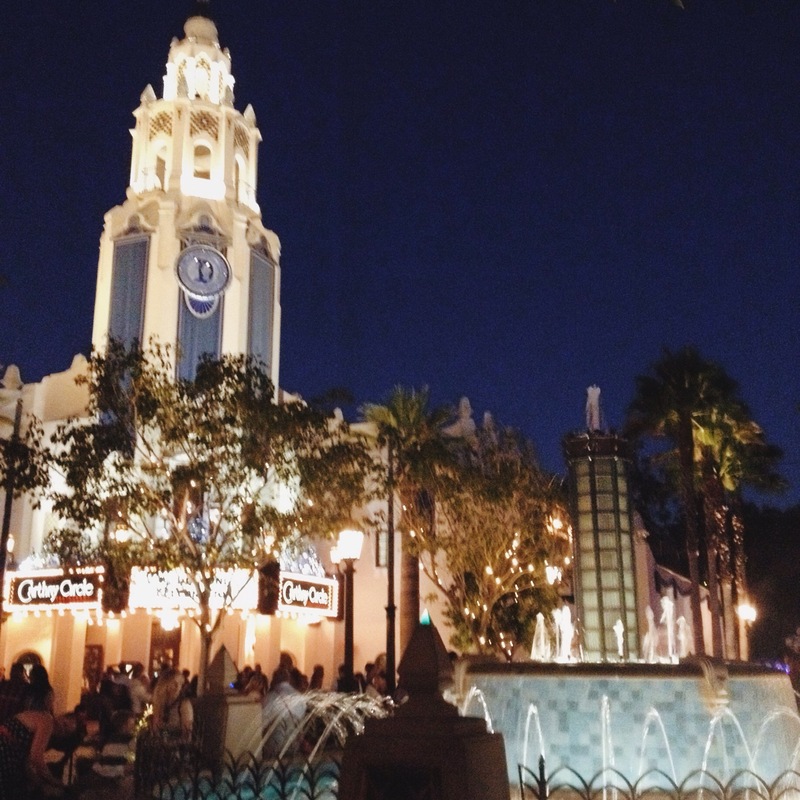 I do feel like Carthay is a good example of “higher” dining than what you find throughout the majority of the parks. It’s wonderful for a night out with someone special or a group of friends. I wouldn’t recommend it for large families or small kids as the menu is more limited, but for a fine Disney Dining experience, it can’t be beat! 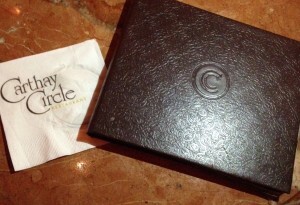 Josh and I had a great time and I would 100% recommend Carthay Circle to someone looking for great dining. We loved it! What do you think? Did I convince you to try the restaurant? Let me know in the comments below and follow @everafterreport on Instagram.